Last year, MAC debuted a series of monochrome sets for all you avid makeup collectors who like to play matchy-matchy with your beauty routine (or just like to stick to what you know!). With a lineup of coordinating nail polish, lipstick, and lip glass, MAC made it easy to embrace color while eliminating the guesswork of having to search for perfectly matching shades across different brands and products. 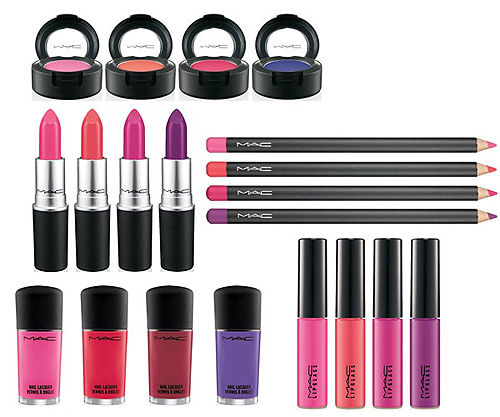 Now, just in time for Spring 2013, MAC is building on their Fashion Sets collection with a slew of bolder, brighter shades that are ready to warm up our makeup looks for the season ahead! Aside from last season's lips-and-nails-centric trifecta of goodies, MAC has extended the Fashion Sets collection to include lip liner and eyeshadow too, so you can really go all out once you find a shade you just can't get enough of.